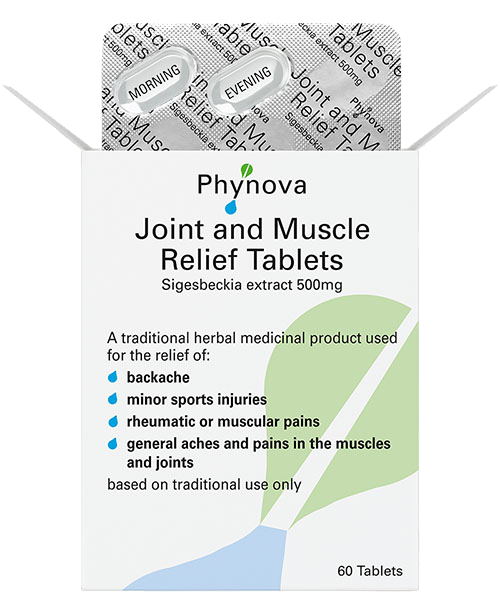 Phynova Joint and Muscle Relief Tablets contain the active ingredient, Sigesbeckia extract. Sigesbeckia was first licensed by a Western health authority in 2015, when the UK’s Medicines and Healthcare products Regulatory Agency (MHRA), granted a THR medicine licence to Phynova Joint and Muscle Relief Tablets. Sigesbeckia has a long history of safe use for relieving a wide range of musculoskeletal pains all around the world, with the first recorded use dating back in 659AD in China. For the past 30 years it has been used in Europe as in traditional herbal medicines, which was the basis for demonstrating its efficacy as a registered Traditional Herbal Medicine for the relief of backache, rheumatic pain, joint and muscle pain, as well as minor sports injuries (i.e. based exclusively on long-standing use as a traditional medicine). What are the benefits of using Sigesbeckia? I have taken two a day since they became available in this country and I will happily endorse Phynova and would not hesitate to recommend its use. I am able to get on with my life once more. A Traditional Herbal Registration or THR is a specific type of over-the-counter medicine licence that is granted to a medicinal product where the active ingredient is a plant or herb. Only products that satisfy the stringent safety and quality requirements of the UK’s medicine regulatory authority, the Medicines & Healthcare products Regulatory Agency (MHRA), are granted a THR and this licence ensures that the product you buy is of pharmaceutical quality and meets strict safety standards. THRs do not have to provide clinical trial evidence of efficacy on the finished product, rather they need to demonstrate the efficacy of the herbal medicine through 30-years of use for the medical condition as well as any bibliographic clinical trial evidence. Only buy medicines from websites displaying the European Common Logo. This system was introduced in 2013 by the European Council in the Falsified Medicines Directive. The Directive introduced harmonised measures to ensure medicines are safe and that active pharmaceutical ingredients are tightly controlled to prevent counterfeit medicines. The common logo should be displayed on every page of legally operating pharmacies and retailer websites.